Because bigger vehicles are even more difficult to park in your garage. This handy parking aid is taller than the original Park N Place, so it is ideal for trucks, vans, SUV's and any other large automobile. Instead of pulling in too far to crush boxes, ruin bicycles, or damage your car, you will always park in the perfect spot, and stop before it's too late. This taller parking aid is easily visible while driving your SUV because it is 62" tall, and has a reflective stop sign at the top that flashes if you touch the pole. Once you place this parking helper in your garage, it will be almost impossible to pull in too far, roll in misaligned, or close the garage door while part of your vehicle is still hanging out. Simply place it to mark the end of your parking spot, and then align it so that the center of your car lines up with the sign. When pulling into your garage, you only have to keep the sign centered in your windshield, and then stop right before you touch it, or even as you touch it. If you tap the pole, the motion activated lights will flash to alert you, and cue you to hit the brakes. It will now be nearly impossible to pull in too far, or neglect to leave room for a second car. After just a few days, it will become second nature to allow this parking aid to guide you in, and you will never have to worry about squeezing your large vehicle into your tiny parking spot again. Incredibly useful and so easy to use, this parking aid is more simple and less expensive when compared to other options. Setting it up will only require a minute or two of your time, and because the batteries are included, you will receive everything you need in one convenient box. The base section in made up of two sturdy plastic pieces that criss-cross to form a one foot wide base sufficient to stabilize the sign, even when bumped. You will attach the two parts together using the two screws provided. Once the base portion is set up, you will then connect the three pole sections together, and then attach them to the base. 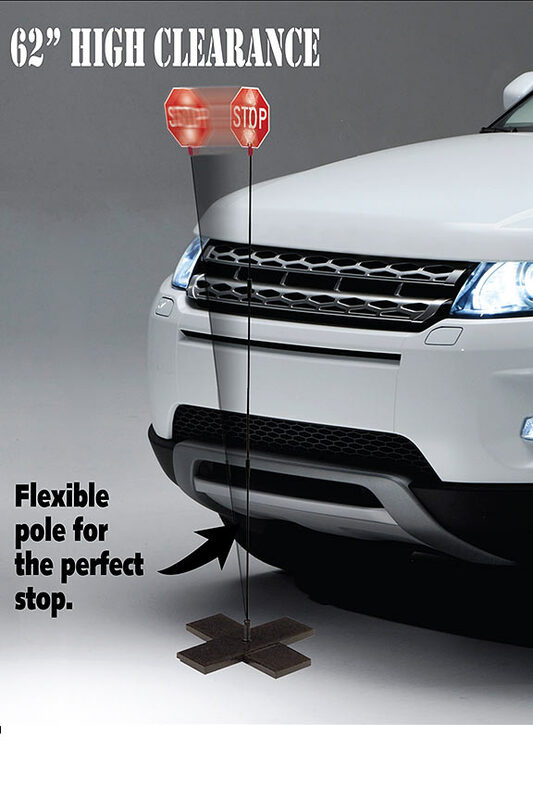 You will notice a spring portion at the bottom of the pole, and this allows it to remain super flexible so that you can bump it without sliding the base or causing any damage. The last step of assembly is the simple action of attaching the reflective sign to the top of the pole. To activate it for use, make sure the switch is set to on and normal. This setting will result in motion activated function of the lights where they turn on when the sign moves, and then off automatically in 30 seconds. The hazard setting will cause the lights to flash continuously for up to 72 hours, and is great for training purposes or for roadside emergencies. To use the SUV Park N Place in your garage, simply place it down to mark your parking spot. You will want it all the way at the end, and in the center of where you want your vehicle. Once in place, it will act as a highly visible guide to align your vehicle as you pull in, as well as a warning light to let you know when to stop. This product may be the best way to ensure perfect alignment each time you park your enormous vehicle in your cramped garage. It is far easier to set up, and also more useful than the popular dangling tennis ball technique. Most of us would prefer placing something on the floor rather than crawling on a latter and stretching and straining to hang a ball in the perfect spot. Not to mention, how you attach the string to the ball in the first place. Also, this parking aid is highly visible, night or day. The reflective surface and bright red coloring ensure that you will see it every time you park, no matter what the lighting conditions are. Add in the bright, flashing lights that illuminate once you get close enough, and it becomes clear how much better this option is. Plus, you can also take it with you if necessary, or use it for emergencies, or teaching a new driver how to parallel park. More expensive options may have a bit more cool factor to them, but do not offer much in the way of increased functionality. If money is no object, or you have advanced technical skills, you may want to peruse those alternatives, but most of us would prefer the most simple solution that works well. Fancy sensors and advanced wiring should get the job done just as well, but is likely out of your price range, or more complicated than what is desired. Simple, fool-proof operation, and easy set up make this parking helper a great choice for any garage, and the high clearance makes it highly visible, even in large automobiles. Use at home to squeeze into tight spaces, or keep in your trunk to use instead of flares. As an emergency device, it will stay illuminated longer than traditional flares, and will be more visible thanks to how tall it is. When used at home, it will help to compensate for reduced visibility caused by cluttered garages, or small people driving large vehicles. If you have ever parked too close to the wall and trapped yourself inside your vehicle, or pulled in too far to scratch your bumper, or crush the kid's toys, you need this useful device. Not only will it show you how far is too far, it will also help with side to side alignment as well. When you guide your SUV into it's parking space using the Park N Place, you will prevent damage, and compensate for less than stellar driving skills. Use one to keep your new car looking new for as long as possible, or give one as a gift to help your elderly relative enjoy the freedom of driving without risking the paint job on their car. Durable materials, and clever design will ensure a long life for this device, and the included batteries will power the LED lights for a long time before replacement would be necessary. Pull in faster, and park with more confidence when you start using this simple and effective tool. Order Yours Today! 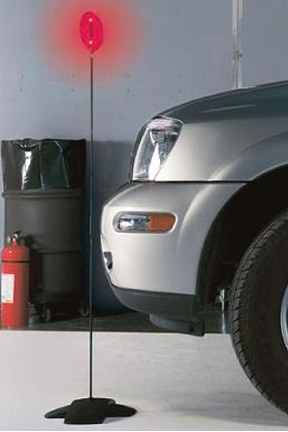 Uses Prevent damage, and reduce the chance of accidents when parking in your garage. Ensure perfect placement of your vehicle. Also duals as an emergency flasher device for roadside problems. Compatibility Taller version. Works with SUV's, trucks vans and more. Also works for regular cars, but the less expensive, regular version is shorter if you only have small vehicles. Reflective Yes - Red sign has reflective front. Lighted Yes - LED lights will flash when sign is bumped. ON/OFF Motion or Manual - Turns on when bumped, and off automatically under normal use. Also has switch position for always on, emergency flasher mode. Battery Type AG13 button cell - two batteries come pre-installed. Assembly Required Yes - quick and simple assembly is necessary for set up. SUV Park N Place - The easy way to park your large vehicle in your garage. No more pulling in too far, and no more accidental damage. Pull in confidently, and then stop in the perfect position. 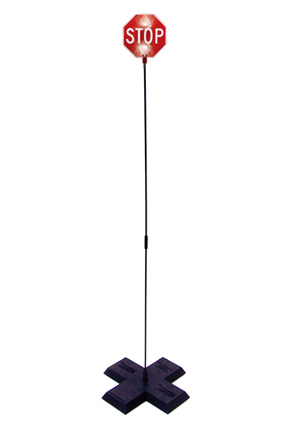 Tall, reflective helper is highly visible, and flashes if you touch it. Order Yours Today! I am very pleased with my purchase. It arrived on time and was just as described. It has been a great help in helping me to guide my big SUV in my small garage. 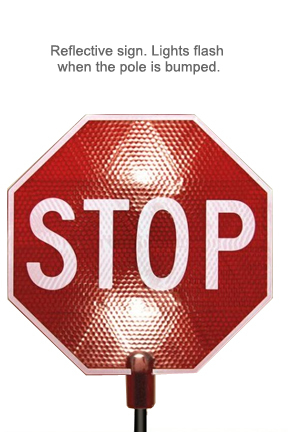 I bought this stop sign to help me judge how far I could drive into the garage with a new car that I was unfamiliar with. It works great. We added a 5 lb weight to the bottom to keep it secure and in a designated spot. Glad I bought it. This little stop sign is a great help for parking our car in our garage otherwise we would have put a hole in the wall. Works great! Taped it to the garage door. I ordered this because I have to store a lot of items in my small garage. Since I drive a SUV which fills most of the depth of my garage, it’s very helpful to be able to move this stop sign as needed depending on how much is stored in front of the car. So for my purpose, being able to reposition it is much better than hanging a tennis ball from the ceiling. The flashing red lights are an added bonus, especially when there’s something fragile like a large mirror in front of the car. The only drawback is that the taller model which can be be seen over a large SUV, is wobbly and less stable. This is one of the best inventions we have seen in a long time!!! Just what we needed!!!! It's exactly what I needed for parking my Ford F-150 truck in my garage. The stop sign comes on when my front bumper hits it and I know I have cleared the garage for closing the door. Love it!!! 2nd review of similar item. See my other review. One is tall enough for my wife's cross-over vehicle; the other is taller and works well with my truck. It is great having two height choices. Be sure to buy a 5# weight lifter's ring and place it on the base with the stem through the center hole. This will keep the device from sliding or tipping over. I've been using the product for a number of years & have been very satisfied. It is an easy cure for correct garage parking; no hanging 'stuff' from the ceiling or aligning electronic devices. Note: make sure the floor position is marked so the unit can be replaced if moved out of line. I have a relatively short garage so needed something so I would park in the middle of the space for walk around room, and to open hatch. I was given a stop ball so when this arrived I no longer needed it. Gave it a 3 because I like the idea of it, but didn't even unpack it so no comment re quality. I have seen and heard others say that this is a good way to park your vehicle in the garage. It takes the guess work out. You park the same every time. I like it. Great little gadget, the wife loves it. Ordered the Park n Place a few weeks ago. Works well now but, after I put it together, had to play around with the batteries to get it to work. Seems to be fine now. I already have two of these for our cars and I've loved them for giving everyone the perfect parking position every time! Now that I've found one for our SUV, I'm set. It has the right height for seeing it above the hood of the truck so that the guess work of parking in close quarters is removed! No more hitting stuff stored directly in front of the SUV. Will the base tip over? Not typically. The wide base, and overall design keep it pretty stable and upright. how do i park 2 cars in garage side to side without hitting side walls and without hitting between car doors? Most people just position the sign so that they can use a fixed object or point on their vehicle to align side to side when pulling in. Place the sign at the center of where you want to park, then use the center of your hood to guide you straight to the sign, and right into position.